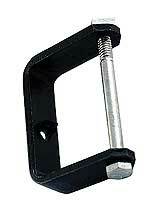 USA made rear spring shackle set, uses steel bushings as original and comes with modern grease fittings installed. Set of two shackles, made in USA. Rear spring U-bolt 1928-31. They hold the rear leaf spring into the crossmember of the frame. You cut and drill to length depending on your leaf spring. Two are required. 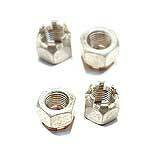 Rear spring U-bolt nuts 1928-31. Shackle bushing 1928-31. 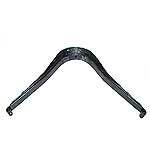 For the rear leaf spring and the rear perches. Duplicate of the original. Made in USA. Centre spring bolt Rear 1928-31. 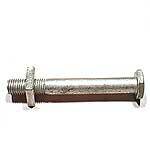 Square headed centre spring bolt with nut. Made in USA. Rear leaf spring Roadsters 7-leaf. Good quality, US made! Doesn't come with the spring clips or bushings. Rear leaf spring Sedans & Pick-up 10-leaf. Good quality, US made! Doesn't come with the spring clips or bushings. Rear leaf spring 8 leaf, Phaetons, Coupes, Cabriolets, A-400 and Victoria. Good quality, US made! Doesn't come with the spring clips or bushings. 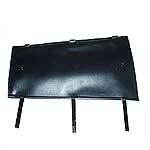 This standard spring spreader spreads the rear leaf spring so it can be removed from the rear end. Deluxe rear spring spreader for the 1928-31 Model A Ford. Spring keeps the ends from coming out of the spreader, acme threaded rods for fast movement, ball thrust bearings. The ends of the tool are adjusted with a rod that is included so no special tools are required. Excellent tool. Made in U.S.A.
Travelling spring spreader 1928-31. It's called the traveling spreader since it is compact enough to take touring with you. This is for spreading the rear leaf spring. One end sets againts rolled end of spring and pipe goes around one of the housing bolts on the rear end. Made in USA. 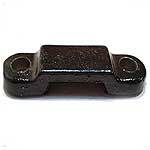 Rear spring clip bar 1-1/8" overall height for the seven or eight leaf rear spring. These brackets are used to hold the rear spring up in the crossmember. Need 2 per car. 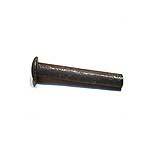 Rear spring clip bar 5/8" Overall Height for ten or twelve leaf rear spring. These brackets are used to hold the rear spring up in the crossmember. Need 2 per car. 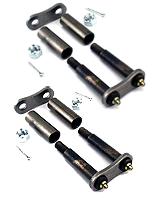 Rear spring clamps for the 1928-31 Ford. Come complete with mounting bolts and nuts. Set of 2. Made in USA. 1928-31 Rear spring 1.380" leaf thickness clamp set. 1928-31 Rear spring 1.280" leaf thickness clamp set. 1928-31 Rear spring 1.10" leaf thickness clamp set. 1928-31 Rear spring 1.50" leaf thickness clamp set. Rear spring clip bolts 1928-31. Two hex headed bolts with square nuts for the two rear spring clips. 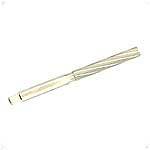 Shackle bushing reamer 1909-31. 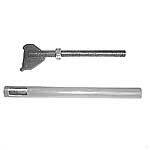 Not a cheap adjustable reamer, this is an American made hand reamer for the job. 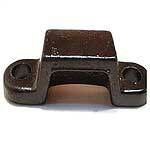 Reams front & rear shackle bushings. Made in USA. Spring covers for the 1928-31 Model A Ford. An old accessory that will make your Ford ride like a Lincoln by oiling the springs. Keeps the dirt out. Covers both the front and rear springs with felt oil strips. This is a quality cover with die stamped tabs just like Ford supplied. Made in USA.